Imagine white sandy beaches, turquoise waters, and the rhythmic gait of a sturdy equine friend below you. If horseback riding along the Caribbean Coast of Costa Rica sounds like a dream come true, we have the perfect horseback riding tour in Puerto Viejo just for you! Our Puerto Viejo horseback riding tours allow vacationers to enjoy incredible sights of Costa Rica's Caribbean coast within the course of a few hours along the jungles and beaches of Puerto Viejo & Punta Uva. What's more, we make sure that our horses receive the finest quality care. When not on tour or in training, our equine friends are always turned out to pasture where they can graze freely and stretch their legs. We care for our horses like family, the same way we greet each of you at the start of our horseback riding tours. Our horseback riding excursions in Puerto Viejo are excellent opportunities for bird watching and getting close to timid wildlife as your horse silently saunters along. Our bilingual guides will be sure to answer any questions that you have about the flora and fauna that call Puerto Viejo home. We can guarantee our horseback riding tours in Puerto Viejo are a vacation experience that you will never forget! Our tours are discounted well below retail price, helping you not only save money on your excursions, but also have a great time! For those who enjoy experiencing nature in harmony with the plants and animals around you, our horseback riding tours departing from Puerto Viejo are the perfect choice to enhance your Costa Rica vacation experience. Book your discounted horseback riding tour in Puerto Viejo with The Real Deal Tours and be sure you are getting the best deals in Costa Rica on the best horseback riding tours in Puerto Viejo! 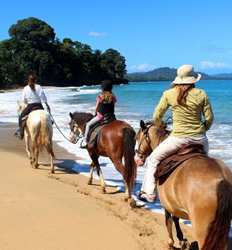 Click below to see the Horseback Riding Tours in Puerto Viejo available to you.